NASA's Mars rover Curiosity cut a wheel scuff mark into a wind-formed ripple at the "Rocknest" site to give researchers a better opportunity to examine the particle-size distribution of the material forming the ripple. The rover's right Navigation camera took this image of the scuff mark on the mission's 57th Martian day, or sol (Oct. 3, 2012), the same sol that a wheel created the mark. For scale, the width of the wheel track is about 16 inches (40 centimeters). NASA's Mars rover Curiosity will scoop up its first batch of Martian soil samples this weekend, scientists announced today (Oct. 4). The 1-ton Curiosity rover arrived at a sandy patch called "Rocknest" on Wednesday (Oct. 3). Mission scientists have deemed it a good spot for the robot's maiden scooping activities, which should begin Saturday (Oct. 6), if all goes according to plan. Curiosity's scoop system, which sits at the end of its 7-foot (2.1-meter) robotic arm, is designed to deliver samples into two analytical instruments on the rover's body — SAM (Sample Analysis at Mars) and CheMin (Chemistry and Mineralogy). But Martian sand from the first few scoops won't make it that far; rather, it'll be used to clean out the handling system, researchers said. "We want to be sure the first sample we analyze is unambiguously Martian, so we take these steps to remove any residual material from Earth that might be on the walls of our sample handling system," Curiosity sampling system scientist Joel Hurowitz, of NASA's Jet Propulsion Laboratory in Pasadena, Calif., said in a statement. "We effectively use [the sand] to rinse our mouth, right, three times, and then kind of spit up," JPL's Daniel Limonadi, Curiosity surface sampling phase lead, told reporters today. This patch of windblown sand and dust downhill from a cluster of dark rocks is the "Rocknest" site, which has been selected as the likely location for first use of the scoop on the arm of NASA's Mars rover Curiosity. This view is a mosaic of images taken by the telephoto right-eye camera of the Mast Camera (Mastcam) during the 52nd Martian day, or sol, of the mission (Sept. 28, 2012), four sols before the rover arrived at Rocknest. SAM and CheMin are the core science instruments aboard Curiosity, and are crucial to its quest to determine if Mars has ever been capable of supporting microbial life. The rover team therefore wants to make sure that the sampling system feeding the two instruments is working properly, so they plan to take their time testing things out. 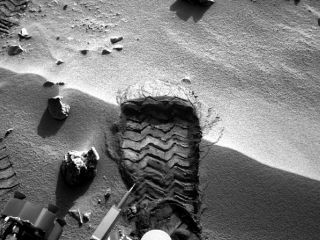 Indeed, Curiosity will likely remain at Rocknest for the next two to three weeks, with the first bits of soil only dropping into SAM and CheMin for analysis toward the end of that stretch, team members said. "This is the most complicated thing. It's an EDL-like challenge, you know, to get these samples through the system," said Curiosity mission manager Mike Watkins of JPL, referring to the rover's harrowing entry, descent and landing inside Mars' Gale Crater on the night of Aug. 5. "Bear with us as we go through the next couple of weeks here," he added. Curiosity is on its way to a site called Glenelg, where three different types of Martian terrain come together. Glenelg lies about 330 feet (100 m) east of Rocknest, researchers said, and Curiosity will hit the road again when its scooping trial is done. Once at Glenelg, the rover team will likely begin looking for suitable rocks to test out Curiosity's drill for the first time. The drill check-out will be complicated as well, taking at least as long as the rover's first scooping activity, Watkins said. While Curiosity is rumbling toward Glenelg, the rover's main science target is the base of Mount Sharp, which rises 3.4 miles (5.5 kilometers) high from Gale Crater's center. The mountain's foothills show signs of long-ago exposure to liquid water. Mount Sharp's interesting mineral deposits lie about 6 miles (10 km) away from Curiosity's landing site. The rover could be ready to begin the long trek by the end of the year, scientists have said. Curiosity is nearly two months into a planned two-year mission on the surface of Mars. It has put 1,588 feet (484 m) on its odometer to date, researchers said.